Tonight, Syfy’s horror anthology series Channel Zero dips back into the Creepypasta chest of frights for Butcher’s Block. 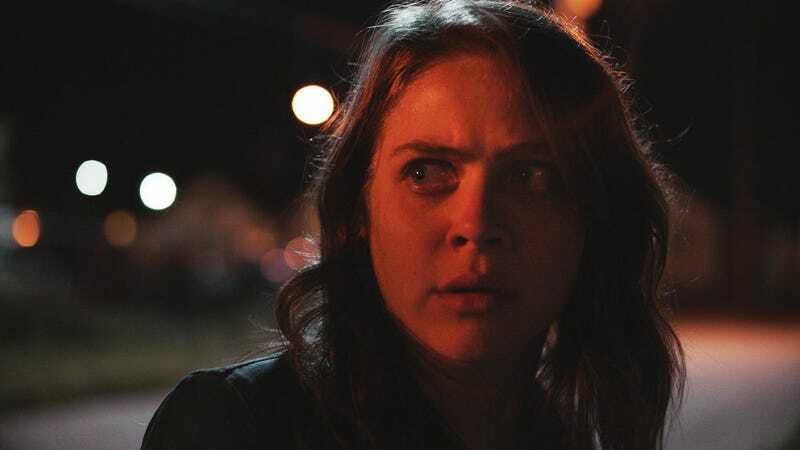 The third season of the show is just as unsettling as Candle Cove and No-End House—with the added distinction of being the goriest Channel Zero yet. We watched the first four episodes (although we won’t be revealing any spoilers here! ), and spoke with the show’s creator and director to learn more. Butcher’s Block is named for the neighborhood where it takes place, once home to hundreds of workers at the nearby meat processing plant, now the most run-down section of a decaying city in generic Middle America. But there’s more going on here than boarded-up buildings, scarce resources, and hopeless poverty. Ask too many nosy questions, or dare to pass through the overgrown local park after hours, and you’ll be confronted by dangerous supernatural forces. If that red-cloaked figure brings to mind Nicolas Roeg’s 1973 thriller Don’t Look Now, you’re the kind of horror fan who will especially appreciate the visual references sprinkled throughout Butcher’s Block. Anyone who’s read the “Search and Rescue Woods” series may wonder how, exactly, these influences of horror and surrealism come into play. The source material is written from the POV of a US Forest Service officer who’s dealing with a rash of missing people, which seems to be connected to mysterious staircases that appear in the deep woods. Butcher’s Block keeps the staircases and the missing people, but adds a lot of material beyond that. Its main characters are a pair of sisters who’ve moved to the city to make a fresh start after grappling with a family crisis involving mental illness. There’s also a young police officer who realizes his hometown is not the place he thought it was, an eccentric woman who befriends the girls when they rent a room in her house, and a strange family with a prominent role in the town’s history. As it happens, the main character’s name is Alice, which allows for some Alice in Wonderland references, as well as other fairy tales, especially Little Red Riding Hood. Butcher’s Block also creates its own blend of dark, surreal fantasy that swirls around the Peach family—once the owners of Peach’s Meats, the town’s biggest employer, whose sudden disappearance in the 1950s brought about the town’s decay in more ways than one. In what’s probably the most interesting Channel Zero casting ever, Rutger Hauer plays an elderly man with an intimate connection to the Peach clan. Without giving too much away—though the title and trailers certainly hint at it—a recurring image in Butcher’s Block is meat. Fresh meat, dead meat, prepared meat, maggoty and fly-encrusted meat... there’s literally a line where someone jokes, “I hope you’re not vegan!”—and they might as well be directly addressing the audience. All the meatiness is the main reason why Butcher’s Block is by far the goriest, most blood-drenched Channel Zero to date. Still, Antosca says, Syfy was fully supportive of this particularly... ah, gutsy season. Channel Zero: Butcher’s Block premieres tonight on Syfy.